These simple guidelines express what I feel should be observed in Avalon and our constitution reflects these values. The Lords and Knights have always maintained the belief that the citizens should be adult enough to resolve differences in a chivalrous and courteous manner and I think we are right in that. We know tensions can get high, but we also expect common courtesy and decency among our citizens. Please take a moment to reflect upon these simple but powerful values and remember that as a citizen of Avalon, each of us promised to uphold them. We do give a lot of leeway and tend not to get involved in personal conflicts, but we will take a sterner approach if need be. Our community is the best I have ever been a part of in SL and I think most of you would agree. Every one of us has a responsibilty to be the best we can be to ourselves and to each other. After many weeks Angel's Labyrinth is finally open to all. Start your challenge by taking the catapult in the village to the Floating Island. Solve the puzzle and the portal will be opened. Reach the end and you will receive a prize! Many, many thanks to Mercurio Lupindo, Vilem Beaumont, Akkarin Dryke, the Knights, Junior Knights and Squires for all the support, help and testing to help make this dream come true. Words are not enough to express the gratitude I feel for you all. Good luck on this test of agility, cunning and patience! Merc, Akkarin and I have been hard at work building a new challenge for the Realm. What started out as small idea to add a little more challenge to an Exorcism event has turned into a major project. A few weeks ago Merc and I decided to add some traps to the Exorcism event we were going to hold. We built a few, then I had an idea for an arrow trap. This arrow trap idea never made it to the event, but I started building one. After Merc and Akkarin got it scripted and working I wondered what we'd do with it. That's when the idea of a Labyrinth came to me. Project "Angel's Labyrinth" was born. It was code named the "sooper sekrit project" and I began brainstorming. I relied heavily on Merc and Akkarin's expert scripting abilities. The result is what we believe is a difficult challenge for our citizens. It's full of traps and puzzles (and death, of course), so it will test your agility as well as your brain. This will not be a required part of either quest, this is purely an optional side thing to do. Our Realm has been getting some wonderful updates lately. We hope these changes will be bring a freshness to the sim and to the community we love. One of the changes was to the Dragon in the Catacombs. Not long ago the difficulty of the dragon was increased for those who have 500 or more kills. He's faster and does more damage. The difficulty remains as it was for the other levels. Are you up to the challenge? Another change is to the sim itself. 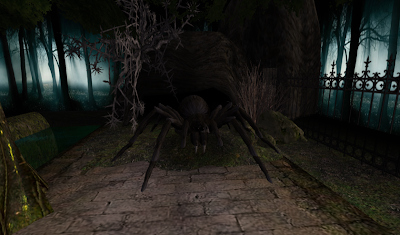 New textures have been added, new landscaping and even a new "friend" in the graveyard area. More changes are coming to the look of the sim in the next couple weeks. Come by and take a look, it really is beautiful! Rumor has it there are other changes coming in the near future. The floating island will be home to a new challenge and there are whispers of a dark presence trying to gain entry into Avalon. If you listen carefully around the sim you just might get hints as to what's to come. I'm really excited to see all this happening and hope you are, too! It's certainly been a long time since we posted on the Scribe, so we'd like to welcome you back with an information post about Knighthood on Avalon. Many of you may have seen us around the sim, the "Knight of Avalon" badge makes it fairly obvious. But if you had any doubts or confusion as to who we are and what we do, or what it's like to be a Knight, let me give you a little insight into us. First and foremost, being a Knight is not a position of power or privilege. First, and before all other things, being a Knight is about personal sacrifice and responsibility. Knights are expected to act as servants and guardians of the Realm of Avalon, including putting members of the community before their own needs and working hard to keep everyone together and happy. How exactly do we do this? Over the years, many of us have found different ways to make our Knighthood unique and provide the community with a sense of ourselves when we are seen amongst them. Personally, I Mercurio am known as the event creator and host on Avalon; most of the events you see I make happen. My favourite so far has to be the murder mystery event, where we stage a story involving a murder of a member of Avalon and our citizens must solve it. I enjoy creating new traps for the citizens to enjoy also, for example I recently made a fire trap, rock trap and spider trap for your enjoyment! You'll also know me as a writer; much of the dialogue you see I've either written or edited. I enjoy very much giving life to the characters on the sim by making them speak. Angel shows great kindness and energy with Avalon. She has a lot of love for the community and the realm, as well as myself her husband. You can see how much she cares about Avalon simply by talking to her. Angel has hosted many balls in the past for Avalon too, as a fae she enjoys dancing very much. Angel has acted as my inspiration and fortitude for many years, and what we bring to one another we bring to Avalon too. Angel is also a swift hand of justice; make sure you behave, because let me tell you that fae magic isn't always flowers and sunshine: it can really, really hurt! Skyler is a proud and caring Knight, who many of you know to be a fun character and personally I think she has many great ideas. Often I've been puzzled about something, looking for that extra pinch of magic and you can bet Skyler will come up with a solution. We also have Skyler to thank for providing our newbies with medieval clothes when they step into the sim. Skyler is probably one of the most level-headed Knights, and always likes to consider a situation thoroughly before forming an opinion. Wolverine many know as our most energetic Knight, and as a wielder of magic. Wolve loves his spells; whenever he visits us, he doesn't go long without launching some mighty and punishing magic! It's obvious to any member of the community that Wolve believes in the people. I've come to know Wolve as a source of many unusual and interesting tools; for example, when recently we announce an execution event he pulled out an amazing guillotine! That's our Wolve I said! Vinderex is definitely one of the most proud Knights you can encounter. He's come to take the mantle of dress code prosecutor; if you dare to show up at Avalon wearing jeans and a t-shirt, you better change into something medieval fast or Vinny is going to eat you! Vinderex has contributed many great ideas for combat and served as a hand of justice in the Realm. Many of you know Vinderex' legendary appetite; how many people has he in fact eaten on Avalon, I wonder? Dozens I'm sure. Hungry dragon for sure! Gabi is our newest Knight, and as such is still forming her identity as one. I've seen her to be very eager and willing to participate in events and is always happy to lend a helping hand. Gabi also has great curiosity, always wanting to know more about the machinations and plots afoot upon Avalon. Gabi is always the first to want to jump into new experiences on Avalon; I don't know how many times Gabi has excitedly volunteered to jump into my evil killer traps! Angel, our wandering fae, has visited the WWF and wrote a post about it. Fae are curious creatures, attuned to the earth and love the opportunity to embrace nature whenever possible. So when I heard of a wildlife preserve I was very excited to go check it out. World Wildlife Federation has a beautiful sim with animals in their "natural habitats". 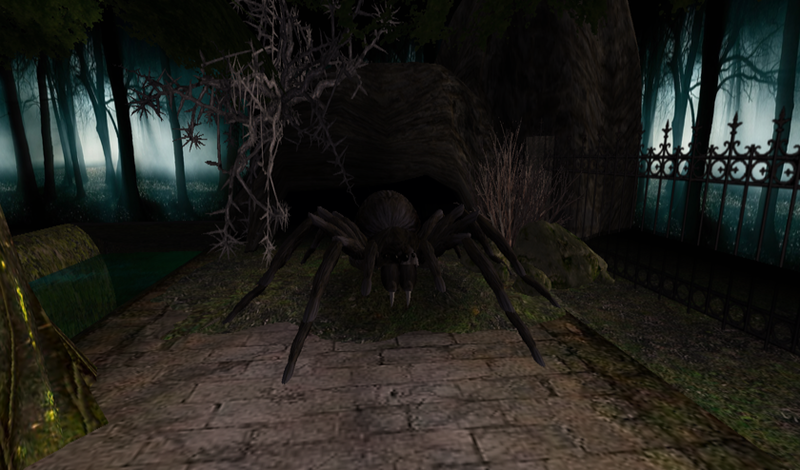 be sure to explore the whole sim, there are creatures everywhere to see and pet. And like any good tourist attraction they have ice cream... *smiles*. There are also 2 nice little mini quests and few nice freebies. Visit conservation island and you may just take home a pet panda. Our Angel has been exploring again and has written an article about Navora for us to enjoy. There are monsters to battle which earns you experience, gold and drops. The gold you earn is used for buying spells,weapons, potions, armor and enchancements. You can also take the weapon and armor scripts and use your own weapons if you prefer. For PvP lovers there's also an area where you can duel to the death and earn PvP points, or you can battle at your home. Be warned the PvP automatically kicks in if you are wearing the backpack when you tp in most places, so be careful. Merc's died at my hand a couple times that way...*whistles innocently*. The backpack you need to get started costs $L499, but after that all the potions, weapons, armor, etc. are purchasedwith the gold you get from monster drops. The backpack includes the DarkLife HUD and a starting shield and sword. Who is this charming fellow? Perhaps I'll ask him to tea. The giant, scaled mythical beast of legends may seem awe inspiring and fear provoking at first; but never fear, for the Knights are here to train you in Dragon combat. Before you face the dragon, you have presumably found a means to enter his lair, and found your sword and shield. Take note: if you enter with a wooden training sword and shield, the dragon will roast them with his fire breath and you along with them. Combat with the dragon is best described as real time strategy mixed with RPG. Combat ensues via the HUD; you will have a sword icon, and a shield icon, and these are used to do battle. Touch the sword icon to attack the dragon; green particles will go to your avatar from a part of the dragon's body. You must click the part of the dragon the green particles came from to strike him with your sword. To block, you will see red lines come towards you from the dragon. This means an attack against you is imminent. It will either come from claws or the head; if coming from the head, pay special attention because it could be a fire attack; these strike for double or triple the damage of other attacks. Click the shield icon on your HUD, then click the part of the dragon's body where the attack came from, thus blocking it and preventing damage. There are attack dummies in the castle, you can use these to test the combat system. The best thing to do in a Dragon battle is focus on the blocking. Can't very well return an attack when the dragon has eaten you, can you? To play it safe, only try to attack with the sword immediately after blocking an attack, or when you see he is currently busy attacking a team member (should you be fighting with another player). Best of luck with your battle. Remember, if you are victorious, treasure awaits you in the chests hidden behind him; also, a Knight of Avalon will happily grant you the new title, Avalon Dragonslayer. Greetings! I am Angel, Knight of Avalon and I will be bringing tales of my many adventures around and outside of the Realm of Avalon. I'llbe reporting on interesting and fun medieval or fantasy sims as wellas fun things in Avalon. My wings do not stay still for long so keep checking back for updates. So, you've visited Avalon Island, explored the beautiful scenery, wandered into the Catacombs and been stung by hornets. After a painful demise, you may begin to panic; but never fear, for I'll introduce you to the dangers and rewards of the Catacombs of Avalon. First you can expect to arrive outside the gates of a large cemetery, filled with numerous graves and other various crypts. Perfect spot for someone to spend time right? We know it's creepy, but it's meant to be. You'll need to touch the dragon orb (it will appear as a rotating golden dragon symbol) for your Avalon HUD. Wear this, and you can enter the gates of the cemetery with spell protection (on the HUD, protection will appear as a golden dragon, unprotected silver. When unprotected, you may be eaten alive by various protective ghosts). Upon entering the graveyard you need to search for clues, and figure out what exactly is the mystery around this place. Be aware, however, that there are numerous dangers; for example, the aforementioned Hornet's nest. Touch this at your peril, because you will annoy a swarm of hornets; you can guess the rest. Never fear, though, for if you do die during the quest (and you most likely will) you simply need to teleport back to the entrance of the graveyard and you'll be ressurected.